Star Acoustic Guitar package at an amazing deal for a beginner player. Start jamming your favorite tunes in no time with this right handed 38 Inches Acoustic Guitar, all you need is included, ideal for beginner students. This Acoustic Guitar features Steel Strings, great for a variety of music genres. All wood construction, beautiful and smooth finish, light weight and very comfortable to hold. Open geared tuners which are easy to maneuver. Wooden saddle and plastic bridge give your strings the perfect height. Guitar Measures: 38 inches length by 14 inches width by 3.75 inches height. Weighs: 2.85 lbs. 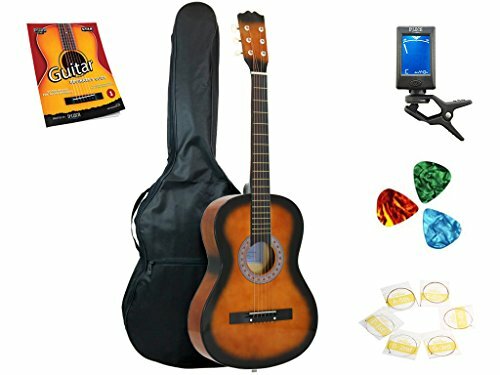 This guitar package includes: nylon carrying Gig Bag perfect for storage and portability, easy to use Clip On Chromatic Guitar Tuner, guitar picks and an 8-page introductory guide with easy-to-follow instructions, such as how to tune your new guitar and play simple chords, to learn some of the most popular children's songs! All wood construction, beautiful and smooth finish. Includes: Gig Bag, Chromatic Guitar Tuner, guitar picks and an 8-page introductory guide. If you have any questions about this product by Star, contact us by completing and submitting the form below. If you are looking for a specif part number, please include it with your message.